I had a bit of hotel emergency before I headed to Seoul recently. I was keen to stay at the Ibis Hotel Myeongdong which Nikki had raved over, but I left my booking too late and there were no rooms available for the time I was visiting. Needless to say, I panicked 😛 With just 2 weeks before I was leaving for Seoul, I still had no hotel room and no idea where to stay. It was while I was scouring Agoda (where I place most of my hotel bookings) that I saw a new offer pop up for The Plaza hotel. A quick check on Tripadvisor told me it was recently refurbished in 2010 and people who had stayed there recently said it was nice. It was a Buy 3 Free 1 offer – perfect for my length of stay so I booked it. Part of the reason I booked it also was because there is a direct Airport Limousine bus operated by Korean Airlines to the hotel. It drops you on the hotel doorstep! Well, the back door but right at the hotel nonetheless, which is very convenient for arrival and departure. Turned out, I did not need that service because I had a friend there who insisted on doing the airport run which was very very sweet. I arrived at the hotel at about 9am and the room wasn’t ready. I wasn’t very upset because from previous experience in Japan, these countries are quite strict about their check in times which was at 2 or 3pm. I could leave my luggage however, and I was told to return at 11am when a room would be ready. So, I took a short 10 minute walk to Myeongdong for coffee and to check out the place. The Plaza hotel is very well located for tourists. 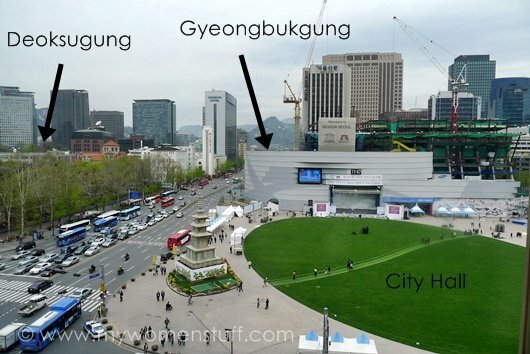 A 5 minute walk out the front door takes you to the City Hall subway station; Deoksugung palace and from there, about another 20-25 minute walk to Gyeongbokgung palace. The back entrance to the lobby takes you to the Sogong-dong Underground Shopping Arcade which leads you to Myeongdong, and tourist shopping heaven. The back entrance also leads you to Namdaemun market, which is just 10 minutes away across 2 streets. I’m very glad I stayed at The Plaza. Other than the location, the room I booked (deluxe twin) was wonderful. The beds were firm but not hard, soft but not too soft. There was a thick warm duvet which was perfectly warm and snuggly on cold days. I hope they change it for something lighter for warmer days because the room can get a little warm. It was perfect for the time I was there and I had wonderful sleep every night. I read on Tripadvisor that some people found the rooms small. I did not find it small. It was compact and comfortable but it might be because I’m Asian and of small stature. There was enough space for me to move around and leave my shopping bags. Everything in the room is controlled by this electronic panel by the beds. 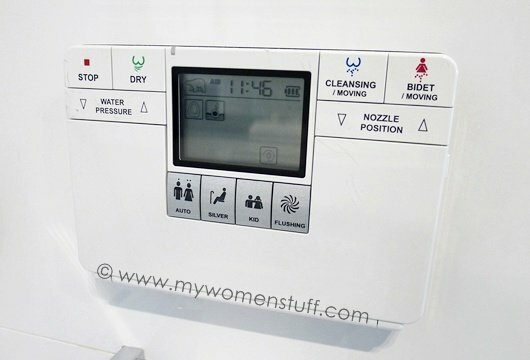 And I showed you the toilet controls before this, which was awesome 😛 The toilet seats are lovely and heated, just how I like them on a cold chilly morning. The Japanese and Koreans really know how to make themselves comfortable! 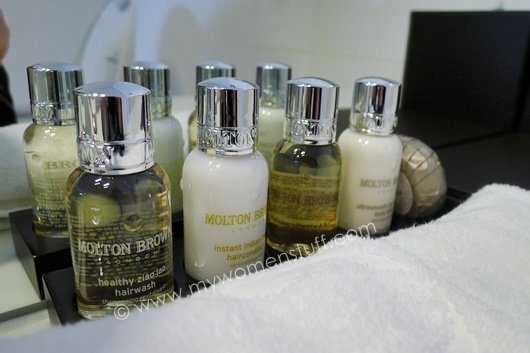 And most luxurious of all was that they provided us with Molton Brown toiletries! Molton Brown is a range of luxury bath and body products from the UK. Awesome! The rain shower was perfect after a long day out, and the water was warm and very comfortable. There was tea and coffee provided everyday as well as 2 bottles of complimentary mineral water, which did save on our having to buy water everywhere. Those of us who can’t be without our internet connection would be happy to know that there is free Wifi throughout The Plaza hotel, even in the rooms. The signal was not very strong in the rooms, but the connection speed was super fast! Korea certainly bears up to their reputation for having one of the fastest internet speeds in the world at this point in time! PREVIOUS POST: Annyeong Haseyo Seoul! I enjoyed reading this. Is it easy to navigate around the city free-and-easy if we can’t speak the language? Thanks Cece. The city isn’t hard to navigate (you can get tourist maps in English at the airport and everywhere) but I did find that the locals don’t speak English very well so it was hard asking for directions when no one understands you. I was free and easy and I was lucky to know someone there and the people at the hotel spoke very good English so I was able to move around without too much trouble. Otherwise though, it can be quite frustrating. Seoul!!! It’s such a lovely country… I miss it … Ibis is like right on myeongdong. Very convenient:) opposite the street of ibis is lotte plaza which isn’t really much unless u’re really rich.. All the branded stuff… I stayed at metro hotel! It was difficult to find this hotel online. I found it using a Korean map 🙂 rm130 per person per night for a deluxe twin 🙂 awesome find! It’s just a few blocks away frm ibis. The plaza looks very nice but way outta my budget! Yes, I wasso happy abt the heated toilet seats! Hahahaha. I hated waking up in d morning n sitting on an ice cold seat. Same as kempinski in jkt and crown plaza in KL. Seems like it’s fashionable. LOL!! Looks like is most certainly is an ongoing trend! I want to go visit again too! LOL I loved this hotel for all its high tech fun and for the excellent shower and beds. But the price was super ouch! 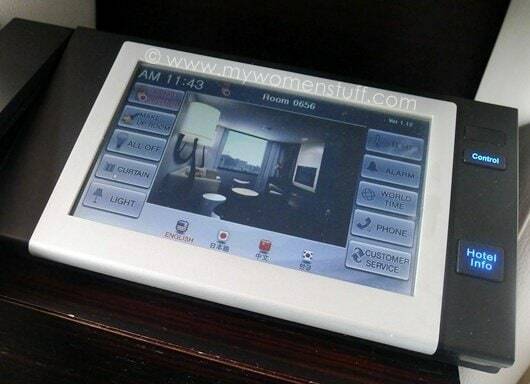 I love electronic curtains – one of my quirks when looking for a hotel! Never been to Seoul, but the Plaza looks great! Haha I am so backward – this was my first time playing with electronic curtains 😀 Such a thrill! Thanks for your great review, the high-tech amenities is very interesting, I have yet to stay in this kind of hotel before. The hotels that I stayed in Korea previously were all quite “ordinary”. Room looks great and not small at all, will keep this one in mind, thanks!